Although this animals mural was hand-painted in Hamilton, Ontario, I sell adorable animal wallpaper murals that ship for FREE in the USA and Canada. They’re so easy to hang and when you’re ready to redecorate, they’re totally removable. Are you thinking of adding an animals mural to your baby nursery? I painted one for parents, Amanda and Ric. 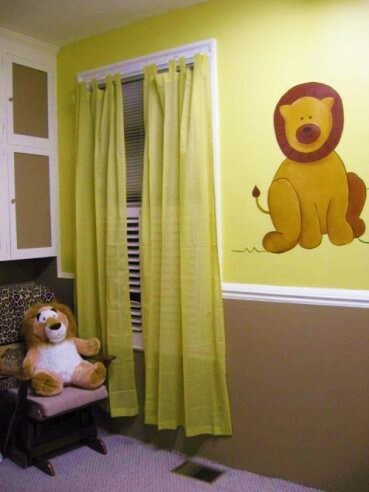 They had no idea if they were having a girl or boy, so an animals mural was the perfect neutral theme. 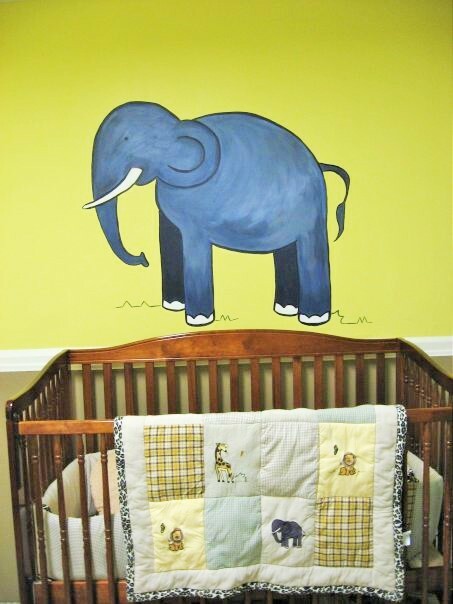 It’s always nice to paint a mural over a baby’s crib to give your newborn something to look at and focus on while they’re awake – especially a high contrast object (like a dark elephant on a light yellow wall), so it’s easier for your baby to see. The animals mural was inspired by the baby’s crib bedding. I paint all my murals with non-toxic acrylic paint and no-VOC latex paint so it’s safe for your kids to play and sleep in their room – even on the night I finish painting their mural. 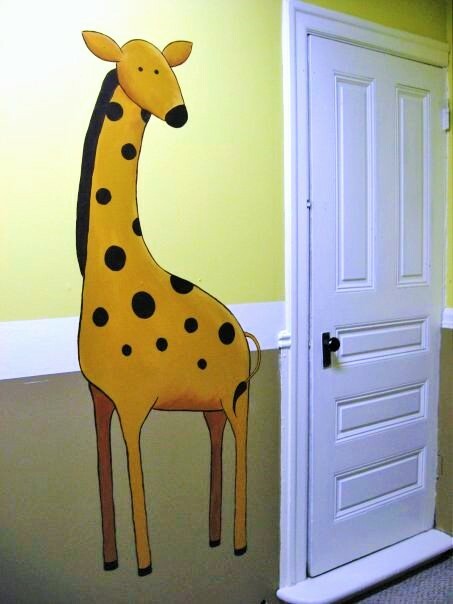 I love painting giraffes next to doors to show off their height. If you are looking for an animals mural and like my style, let’s work together! I’ve painted murals, from Toronto to Niagara Falls, since 2005 – and I’ve even painted a kids mural for a Mike Holmes TV Show! Join my newsletter community and I’ll send you all the latest promotions and maybe even some hot coupon codes!